I’m not a fan of raw veggies ~ not yet. Sometimes though I have cravings ~ weird ones. Like vegetable cravings! It’s not officially a Korean snack but there are times when you just want to eat something flavorful but not too fattening. What I do is that I get half a cucumber and slice them into sticks. 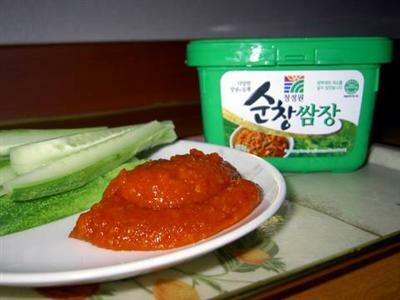 Put a tablespoonful of “ssam jang” and use it as a dip. Westerners usually dip the cucumber in mayonnaise but the Korean way is healthier. “Ssam jang” is mainly a sauce (jang) for “ssam” or vegetable leaf wraps, a unique Korean way to eat rice. A spoonful of rice is wrapped in vegetable leaves like lettuce, Chinese cabbage, sesame leaves, fresh seaweeds with the seasoned soybean sauce. “Ssam jang” can also be used as dips for cucumber, carrots, pepper, celery and other vegetables you can think of. A 500 gram container costs 2,600 KRW ($2.60). Parang masarap yan ah.Alam mo sa malimit mong pag post about Korean food and the likes, siguro you should start compiling them and make a book. Start ka muna as a scrap book, then pag marami marami na, i launch mo dito sa net. Ask for visitors comments, para madali ma convince ang publisher. Much better, if you have the money, publish it yourself. There are lots of Koreans where we live and so lots of Korean stores and Korean foods. When we go to the International market,I see lots of Korean stuff, just don’t know what they are or how they are supposed to be cooked. Kimchi, that I know very well because I eat kimchi. But they seem to make kimchi with different stuff, aside from the regular napa cabbage. I am looking on websites for Korean traditions for my friend and I can across this post. This recipe looks like a great idea. However, as a westerner I would never eat cucumbers dipped in mayonaise. That would be gross. Most people would probably use a vinegar based or sour cream based dip with dill or other flavorings. Meron nyan sa mga korean grocery stores dito sa Pinas. Not sure though kung meron sa SM supermarket.